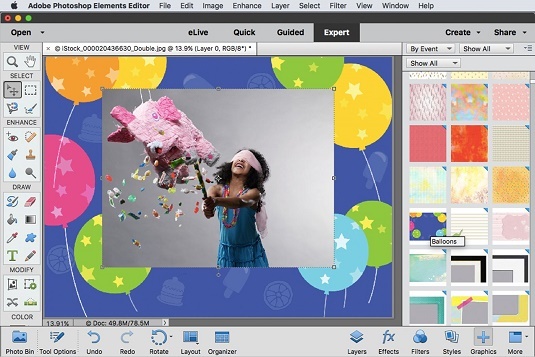 In Expert mode, choose Window→Graphics or click the Graphics icon in the bottom right of the workspace. Choose your desired category of graphics from the left drop-down list at the top of the panel. For example, choose by color, event, seasons, and so on. Depending on your selection, choose a more specific category from the right drop-down list. For example, if you choose Event, then you may choose Birthday or Wedding. Choose your desired type of art — Backgrounds, Frames, Graphics, Shapes, or Text — from the lower-left drop-down list. On the Graphics panel, click your desired effect or drag the effect onto the image. Be sure and convert your image into a layer before you select a Background graphic. Otherwise, the Background graphic will essentially replace your image. If you have a layered file and you choose Frame, you’ll get a message in the frame to “Click here to add photo or drag photo here.” If your image is not a layer, Elements will automatically fill the frame opening with your image. In your Layers panel, select any your graphic layer(s) and choose Image→Transform→Free Transform to scale and rotate your graphic. The Graphics panel provides an abundance of backgrounds and frames. Elements 15 has added more than 50 new backgrounds and frames. The newest ones are easy to find. They’re at the top of the panel.